You have probably walked by this willowy sapling many times--although I suspect if it were not in fall color, you would have walked by it barely noticing it! 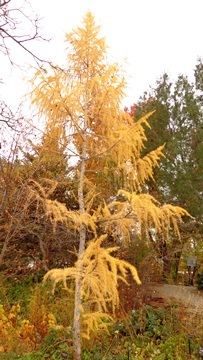 There is another specimen or two of Siberian larch at the Gardens. This one is west of the Western moongate just outside PlantAsia. If you're a tree fancier, you might linger for a moment and think, "A larch from Siberia--I suppose there are larches there." As botanic gardens mature they often focus more and more on recondite research issues, or more global conservation concerns almost forgetting what most people expect. Visitors who come are usually curious about plants. How wonderful it would be if they would realize that the modest specimen at the Gardens often represents a major plant where it comes from. 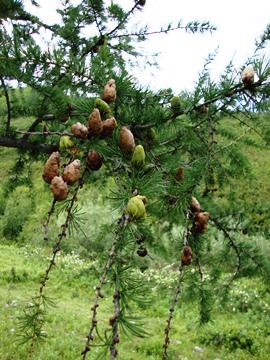 So it is with this larch which covers literally millions of acres across the breadth of Asia. Here you can see what heights Siberian larch is capable of attaining in the wild! I was very fortunate to have had Plant Select underwrite a trip that Mike Bone and I took to Central Asia in 2009. 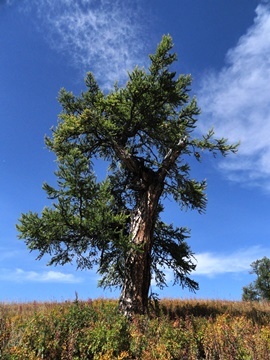 One of the many highlights was seeing thousands of enormous Siberian larch everywhere in both Kazakhstan and Mongolia. 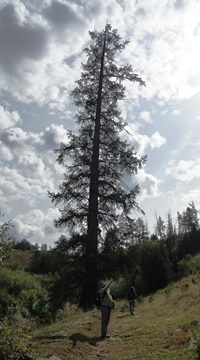 Unlike our native tamaracks in both New England and the Pacific Northwest and Alaska, their Siberian cousins often grew on steep, sunny slopes rather than wet streamsides and bogs. They formed open forests all the way to dry treeline, but could be found also isolated on surprisingly dry areas in the higher steppe, growing among sparse grasses and sage. This specimen was enormous. 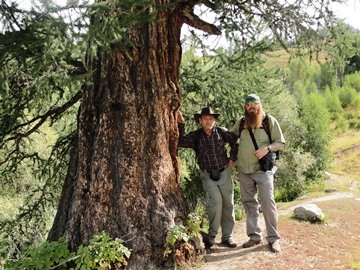 Here you can see Mike Bone on the right with our guide Vladimir Kolbintsev, leaning on that same giant tree. I doubt I will be around to see the saplings planted at Denver BotanicGardens attain half this size and girth--but it would be fun to do so! We could scarcely believe our eyes as we approached--this one had even greater girth, and the most rugged habit. 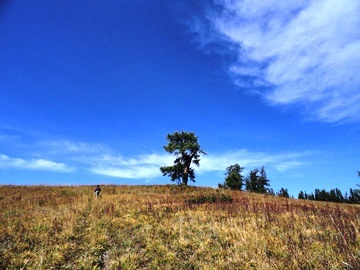 We could see the highest peak in Siberia (Mt. Belukha) from the pass. Not far away (near the very heart of Asia, equidistant from Indian, Arctic, Atlantic and Pacific oceans), this area experiences unbelievable cold in the winter, and the winds on this alpine summit must be hurricane in force for months on end. And yet here it grew, almost solitary, as picturesque as an ancient oak in Windsor Great Park. The needles are so fine and soft, the cones are so delicate that they belie what must be ironclad toughness in the tree itself. 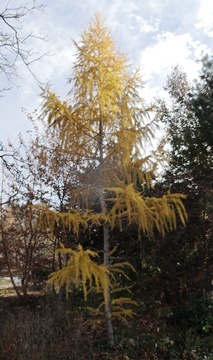 I have always felt that larches would be a wonderful addition to Denver's parks and streetscapes because of their airy look and toughness. Siberian larch I fancy would be the best choice, although I know of almost no commercial sources. Unfortunately, our local landscape contractors aren't familiar with larches. I know of several instances where larches have been removed in winter because it was supposed that they have died when their needles fell. It would take quite a campaign to educate our local populace about them. But I think it's worth doing! 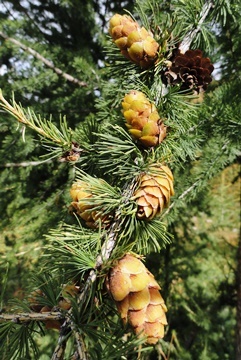 Another glimpse of the nearly golden cones in the late summer. Makes you want to look inside them! We end where we began, with our still very modest larch. Seeing the venerable specimens in Kazakhstan, one can appreciate how these might one day grow to be massive and imposing. More to the point, perhaps, one is humbled to realize that every one of the tens and thousands of accessions of plants at Denver Botanic Gardens has a compelling story much like this one. The world of plants is infinite!